"This is a small family production made by Yi people in Mengla. Early spring 2007 material from wild arbor collected at around 1700 meters migh. The mix of large leaves and early spring buds makes this cake very balanced with notes of campher throughout the infusions. A very nice cake." I bought a sample of this cake for a couple of reasons, the main one being that I liked the simplicity of the wrapper, I also have had good experiences with this seller. There is something about the wrapper that is appealing, the producer hasn't tried to 'tart' the tea up by adorning it with a pretty coat. Usual parameters : yixing pot with bamboo charcoal filtered tap water. The aroma from the freshly brewed pot is about right for a 2007 pu erh, it's somewhere half and half between it's young character and something that is starting to mature, a teenage tea. The soup is a pleasant yellow and amber, no signs of any attempts to pre age the tea. It also pours really well from my pot with an even flow, the small spout isn't blocked by any leaf fragments. Further examination shows that the spent leaves are largely intact, whole and of good size. The stalks are particularly thick and robust. Small production wild arbor? perhaps so. Still though, it's not an expensive bing at about £26 and for something of that price you shouldn't expect too much. I've been amused by the wrapper and the nature of the leaf but the actual flavour of the tea is a little underwhelming. 'Well balanced' it may be but it doesn't have any outstanding quality, nice but not captivating, I found myself steeping it for long periods too to try to coax more out of it so it's a little lacking in legs. In summary, there is much to like about this tea for what it is. The romance of a small run with sturdy leaf is alluring even though the potency of the soup is a little lacklustre. Anyway, happy new year tea drinkers! May 2010 be a good year for drinking! 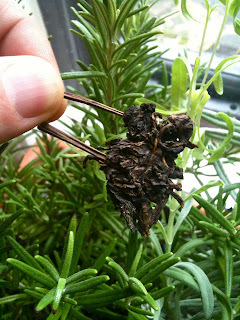 Three months ago well known tea blogger Hobbes ran a sample tasting experiment using several bings from Yunnan Sourcing. I was unfortunately too late to sign up but not deterred I ordered samples of three of the better teas. Three months later my samples arrived (where have they been? ), which is no fault of Yunnan Sourcing. This particular sample was the favourite of the lot in Hobbes' opinion so I was looking forward to trying it. The dry scent of the leaf has grassy tones above the thicker aroma of a dark honey. The post infused leaf was more typically that of a new pu erh and not something I am all that fond of in general so I don't hang about to analyse it. Forgive me if my initial impression of honey has biased my taste buds but to me it is the overriding characteristic of this tea, not a bad thing. Falling in line with other reviews of this tea I can clearly taste the mushroom after the 4th infusion, it comes to the fore once the initial sweetness starts to taper. I'm not entirely bowled over by this tea, but I'm not really that keen on brand new sheng pu erhs in general. It's still pleasant to drink now though although it doesn't inspire me to purchase anymore beyond the sample. Aromatic dry new leaf with greens, browns and slivers of tips, the aroma from the pot after the first infusion is very legume, there's no denying it's from 2009. The first infusion is surprisingly light and floral with a early appearance of huigan supplemented by a good energetic buzz on the outside of my lips. I slow down my intake to really observe the qi. Hints of liquorice with a quick appearance of bitter that arrives and immediately departs. It's such a world away from the '99 7542 I drank earlier in the day, it's young, fresh and floral, almost perfumed, lingering pleasantly on the palette. No fireworks though or anything characteristic that grabs the headlines especially. There's a little bit of pepper to the aftertaste a couple of minutes after finishing the cup. After a while it gets a little too much for my tastes, just a little too green, and I back off from the session. In reality its not so amber, good news! I've been buying a bit from Sampan Teas on Ebay. It's a very small outfit that hasn't even achieved 100 feedbacks yet but they always stock small amounts of unusual tea and quite refreshingly always change what they sell so it keeps me interested to go back once in a while and see what they have. I'm sure if you had some sort of word randomizer that contained various tea names it wouldn't take it long to come up with 'Yi Wu Old Trees', you just see that sort of a name all the time and I personally don't actually think that the bing actually would be made from much of the stuff. At £28 it's not a very expensive cake but I still thought I'd just pick up a sample and give it a whirl. Usual parameters, bamboo charcoal water, 5g of leaf, short steeps all in my sheng yixing pot. It's good to see that the soup on second infusion (pictured above) wasn't too amber (despite my iPhone camera making it look so), hopefully it's not tweaked. On the first sips I felt good energy on my tongue, it went through the surface layer quite quickly, that's a good sign. Further down the road it's a little harsh still at times with a strong ku bitterness, but to me thats a good sign. Even better than that is the sweet and lingering huigan, giving me a rollercoaster ride of bitter and sweet between sips. I really do like this tea, it's one of those samples that has convinced me enough to go for a couple of bings. The price is right and I am rather curious to see what will happen to it's properties over the next couple of years. Only one way to find out! I woke up this morning to find my car iced over and the ground dangerous to tread. The school run over I find solice in this dark old pu erh. I sit in the gloom and savour the subtleties beyond the earthy palette and from within the yin comes forth yang for one cannot be without the other. I have liberated some of my tea from the Royal Mail! Huzzah! Thanks to Nada for providing me with a tea from one of the best years of my life. 1993 was a rock and roll year for me in Hong Kong! The leaf looks much older than the '99 7542 I drank last week with almost rusty browns and a very light white dusting. A quick rinse and then straight into the action. I'm keeping the infusions short to not darken the soup too quickly but still it eagerly shrouds over. The '99 was rather quite woody, like something fresh cut from a carpenters shop where as the extra six years of storage has mellowed this characteristic out somewhat. It's more like an ebony or mahogany that quietly numbs my tongue and leaves me with an initial aftertaste that reminds me of brazil nuts. It's smooth but the sweet huigan is much more elusive than the '99. With all the hubbub of the last week it's just so pleasant to sit down with a new tea and 'kick back' in modern parlance. I've bitten off perhaps more than I can chew in my studies, simultaneously studying a diploma in Chinese herbs at the London College of Chinese Medicine, nose diving into herbal formulation and classical pathology with Arnauld Versluys and preparing to restart my second year studies at the College of Traditional Acupuncture in Warwick. Oh well, in two years time I'll be through the worst of it. I have spent a lot of money on tea this month and it's troubling me. Included in my purchases has been Gyokuro @ £17.50 per 25g, Oolong sampler @ £11.50 per 50g and Da Hong Pao @ £8.15 per 18g. 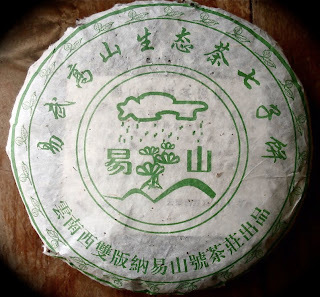 I have also bought some pu erh, 1999 Menghai 7542 @ £7.90 per 25g, 1993 Menghai 7542 @ £10.50 per 15g, 1980's wangzi @ £3.40 per 20g, 2009 Yi Wu @ £3.93 per 25g and 2009 Banzhang @ £3.93 per 25g. It's not that there is too vaster quality difference between the two sets of teas either. Neither choice of tea is too low or too high, it's just a nice selection of decent teas. 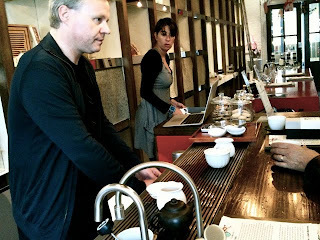 Let's have another look shall we at Yunnan Sourcing's 2009 Menghai 7542. A full bing costs £6.65 per 357g. Cost per gram : under 2p per gram! Not convinced? How about Nada's Bulang bing? It's a serious tea with awesome qi, really quite scary if not handled properly. That's not even 7p for something that could be described as a 'boutique' tea. Ok, so pu erh can go a little crazy. Nada also sells a 1980's Da Ye bing. One final consideration too is that pu erh can normally be brewed more times than green or oolongs and in my opinion pu erh provides far more interesting qualities in the taste of the tea. Giving the 2009 7542 as an example, what sort of green tea would you be expecting that costs £7 for about 400g? Everyone goes on about the cost of pu erh being high and silly but from where I'm sitting (at my tea table) the maths seems to suggest otherwise. Thoughts? It's not all in my mind..
My last post was a little long, today's post will be short. I've drunk a lot of tea recently but not so much pu erh as I've been 'playing' with other kinds. I felt in the mood for some pu erh again so I opened up my American Hao 901 bing. First thing I noticed was a honey aroma I hadn't spotted before, then the leaves looked different from what I expected too. The soup was a darker amber and the taste didn't have much apart from brown sugar. On the bright side, at least I did notice. If I had missed that I would of been really peeved. "Please don't give up on yancha!" Were the wise words to me from Nada. So I took four yancha teas and tasted them one by one over a day or so. I ordered the 'Oolong Explorer' set that contained a 10g sample of this tea. It's priced at £20 for 50g making it the priciest tea in this comparison. The blurb on the website goes into detail of the exact source of the tea, saying that 5kg was obtained from a total production of 15kg reinforcing the idea that this tea is exclusive. The aroma was captivating with a floral layer to it, something I wasn't expecting but it kept my nose at the pot for some time. The quality fragrance was accompanied by some fantastic qualities in the flavour and thickness of the soup. It had peaches and cream with a distinct oily character, a real joy to sip. This tea made my day and hours after drinking it I was excited and alive about my experience with it. It surpassed my expectations by some distance. The second sample from this vendor in my little taste test. This tea is the cheapest of the two priced at £11 for 50g, almost half the price of the Big Red Robe. 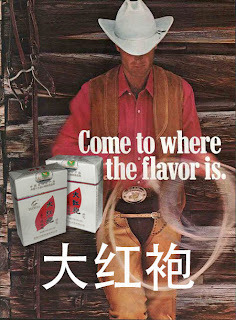 I found it rather telling that the vendors website doesn't really say much about this tea, just one sentence. "Full, firm and satisfying, with ample richness and lifted by unexpected grapefruit-citrus aromas." Where is the history and the passion about the origins of this tea? Just a short period of time from my first experience of this tea where I just didn't get a grasp of it, I'm having another go. Previously I brewed the tea in a gaiwan, which to my mind keeps the influence of the vessel to a minimum, but as with the other teas here I am using a pot instead. Price wise I'm trying to remember the exact cost but I think it was about £6 for 20g 左右 (or thereabouts), don't quote me on that! Following John's instructions I am keeping the brewing times much shorter with his tea, starting at 15s and even so the first infusion is surprisingly coloured, much darker than I would of expected. After pouring into my chagang 茶缸 I immediately inspected the aroma of the pot, it starts off potently nutty and about 7-8 seconds later the sweet dark berry scent rushes onto the scene. The flavour is markedly different from the Jing Tea London wuyi teas in this test. It's certainly less floral on the palette and given the colour of the soup being a richer amber the tea must surely be more roasted. If I am honest, the flavour of this tea doesn't capture my imagination, however, the chaqi 茶企 is very significant. After a few cups I am quite tea drunk. The next step in my education of yancha 岩茶 and more specifically, shui xian 水仙, is to try another vendor. 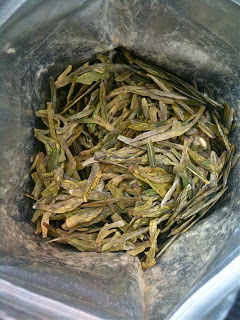 I have ordered a sample of Jing Tea Shop's (not to be confused with Jing Tea London) competition shui xian. This vendor is a place I am fond of as it's only 60 seconds walk from my front door and the proprietor, Maria, is a lovely, bubbly tea fan. It's a shop born of passion and love for a good cuppa, which gives it much merit from a spiritual sense. Her 大红袍 is the cheapest of the teas in this test at a snip under £10 for 50g. Heavily roasted and dark, the soup is the deepest amber of them all. The aroma from the pot just after pouring has an initial quality that leaves me cutting my inhales short, the roasted smell gets right at you! Again there is a transition to a sweet aroma after a few seconds but it's not as enchanting as the 水仙 or Jing Tea London's 大红袍. In taste it has the 岩茶 flavours on view but like the 肉桂 it leaves me a little flat. To the less enthusiastic tea drinker it might seem rather costly still but I this wouldn't be a bad place to have a little look at wuyi teas. Would I buy it again? I would have to say no, I just want more from my tea and I'm prepared to splash my cash for the finer product. 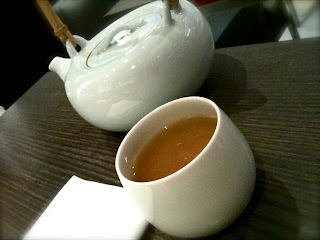 Jing Tea London 大红袍 : Great flavour, soup and aroma. I loved it. 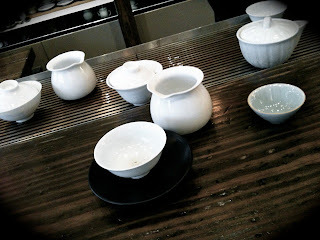 Teasmith 水仙 : Intriguing aroma and knock out chaqi! Jing Tea London 肉桂 : Reasonable floral flavour but not captivating. Golden Monkey 大红袍 : Entry level wuyi, heavy roast. What a great way to spend the morning, just me and some tea. I think I have rather overdosed on 岩茶 though, I should be as thin as a rake if all the silly weight loss marketing was to be believed. As a learner of tea it's very beneficial for me to keep trying various samples of tea instead of committing to buying larger quantities just on the vendors sales pitch. Even though it is expensive I would certainly consider buying Jing Tea London's 大红袍 again, there was something special about that tea that stood it out, it just felt right and I should follow my feelings. I was quite enchanted by it.. Bit of a conundrum today, what is the point of me drinking mediocre tea? Ok, if I'm away at work and the environment isn't conducive to enjoying the finer points of tea.. fine. Drink the 100g for £10 stuff. When I'm at home though I don't think I should settle for anything but good tea. It's ok to just want to saviour the finer things in life right? Speaking of 100g for a tenner, how about 100g for £12? 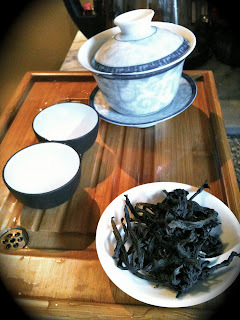 A while back I went down to Teapigs in Brentford and purchased some of their Dragon Well and Mao Feng teas. The idea was that I wanted to see what level of tea this company was actually producing, which in my own eyes was the bee's knees not so long ago. I also ordered some of the lowest grade Dragon Well and Mao Feng from an online Ebay store, both companies were around the same price mark and the exercise was to compare quality. I'll post a comparison picture of the Mao Feng when I am home, it's good for a laugh. The Long Jing doesn't look so green in this picture but it's alright, little bit twiggy too so I'm expecting it to be machine processed. It has a similar taste profile to Teapigs Long Jing, fresh grass with a lemon zest and slightly buttery. I'm not going to hang about dissecting this tea, it's not special enough to be worth it really. The real question here is a moral one. Would I be happy to sell this level of tea at my own tea bar? For sure the casual punter would love it and think it's all rather good, but the reality is that it's not all that swanky. I am rather torn on this subject. Michelle is an unusual case for a filipina, she lived in the super hot and sticky environment of Cebu but seems to be impervious to cold here in the UK! When I'm all wrapped up Michelle wears t-shirts. All well and good? Perhaps not. She seems to suffer from 'Heat' in the sense of the pathogen. Her skin has several signs of Heat and over the last couple of days her lips were red and dry. Her tongue was also showing small signs of heat but overall it's not excessive by any stretch of the imagination. 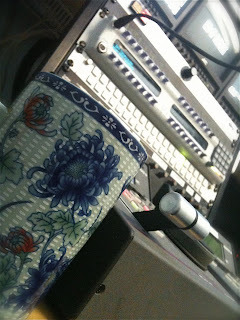 I thought then that I would make her some 菊花茶 jú huā chá (guk fa cha) Chrysanthemum tea. Energetically it's cooling and it's taste is bitter and sweet. It is also in the category of acrid surface releasing herbs and it enters the Liver and Lung meridians. It's not a great match to her condition, 金银花 jin yin hua or Honeysuckle would of been better as it's cold in nature and enters the Stomach meridian. I boiled up some spring water and then took it off the heat, added some dried flowers. This was left for 15 mins to infuse before I added some nice local honey straight from the comb. After it cooled down I bottled it and left it for Michelle to compliment her dinner. Seems that I have forgotten my pu erh's this week and have gone for greener pastures. 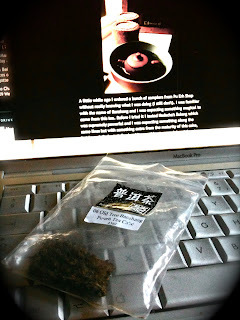 Yesterday I was enjoying a Bi Luo Chun and today it's my best rolled Taiwanese oolong from Da Yu Ling. You must excuse me though as I haven't found out where I got it from, not too surprising though considering the myriad of online sellers. Perhaps I am just going through a phase? Or perhaps it is because I have a shed load of green and oolong teas that should be drunk when fresh? Maybe it is just to take a break in my tastes and 'reset' my palette. Either way, it's very enjoyable. Today's tipple is going down extremely well, it must be on it's 5th infusion at the time of writing and is holding up very well. The huigan is only really coming to the fore now and is holding on my tongue in subtle but enchanting waves. I am having to really concentrate on the dynamics of this experience as Michelle is busy vacuuming around me but my mind is at peace, the hubbub doesn't agitate my mood and I am taking that of a clear indication of how calming this tea session is. Today's water is of higher quality too, Highland Spring from Sainsburys. I had been sourcing my water from hoarding the free bottles at work. Nine litres doesn't cost much so it's not a problem for me as water quality is so important. I used this water to prepare the first litre of oolong-bu-cha with a little apple cider vinegar to lower the ph of the brew as I had no starter liquid. My Kombucha has been fermenting for a day now and, rather unsurprisingly given the temperature, isn't reacting much. I'm expecting this culture to be a little sluggish and perhaps it will take about 10-14 days for this first batch, if not a little longer. The scoby seems at home though already. Teasmith Bi Luo Chun and a new oolong idea..
Just a quick one, a couple of posts ago was about our trip to Teasmith in London and I was left with the decision of what tea Michelle would have. I ended up opting for the Bi Luo Chun as an odds on hit with its smooth sweetness and great aroma. Needless to say it went down very well in terms of drinkability and acceptance from Michelle (someone who is not naturally born into tea drinking being a Filipina). Today's session is just some casual drinking on my day off and I thought I would make some of the Bi Luo Chun. Prepared in my gaiwan with some of my better bottled water this tea has excellent aroma, it really is a pleasure to pour the soup off, let some of the steam from the leaves gather under the lid of the gaiwan before releasing it and capturing its fragrance. The colour of the soup resonates with the delicacy of its flavour, it's sweet, pure and slightly buttery. The perfect accompaniment to my lazy afternoon. I just love the transparent light jade hue. Now I feel gathered I will be moving onto my next project today. I have received a kombucha culture in the post. For those who don't know, kombucha is made from highly sweetened tea that is transformed by the culture over a few days into a health drink. The sugar and certain parts of the tea is consumed with the by product being vitamins and healthy bacteria like lactobacillus. I have made lots and lots before but always with horrid Twinnings green tea bags. I have decided to give it another go but with an oolong this time, the oolong in question being the relatively cheap Teapigs' Dong Ding. What will be the outcome? Tasty kombucha with a hint of oolong or just plain old kombucha. It's going to be interesting to see if the quality of the tea can really affect the taste or will the cultures process prove too overbearing. Watch this space. Dark and twisted with a cereal aroma, what sort of tea do I have here? I'm not sure. I purchased 20 grams of this tea from my recent trip to Teasmith as a bit of a stab in the dark. I had no idea what it was but I thought it would be fun to buy it and try it. I rinsed the tea quickly and found the aroma interesting. At first it was the same cereal tone I found from the dry leaves but it transitioned into an interesting black current. The transition of the aroma was quite noticeable and I hoped the taste would be similar. I did a quick google to find out more background knowledge on this tea but I found nothing other than the usual barrage of weight loss sites associating themselves with WuYi. Unfortunately I didn't really get much from this tea other than the same cereal like tone in the taste. I tried to over brew it to get something more but I didn't succeed. It definitely aroused my head but not in a way I like. Post brewing I examined the leaves and found then to be long and very very durable. They had been folded lengthways several times which was interesting. The tea was fascinating in the way the aroma developed and in the leaf itself. I didn't, however, have much from the taste though. Such a shame. Perhaps I will enquire at Teasmith on my next visit on how to approach this tea. Just hours after I made this post I was sent an email from John at Teasmith. ...As for the taste, it should be more complex than you experienced: initially almost sour, smoky, charcoal taste, being replaced with a toffee/caramel sweetness after you swallow the tea. A chef we know made a pistachio dish using this tea since he felt that the nutty character was dominant. First note then, great job Teasmith for taking the time to inform me. I was being quite conscious of not saying it was a bad tea as I don't think Teasmith would sell one, I just didn't 'get it'. I will give it another go soon and change the water I used, which was an average bottled water. I should also try it with some more leaf I think. Michelle and I decided to have a good look at various health and tea shops in London to see what sort of environments were available with a mind towards setting up our own place. We trawled around various hideous Chinese medicine shops in Soho resplendent with various 'herbal viagra' posters and untidy shop interiors. Ghastly. Hungry and thirsty we headed off to Yauatcha, a restaurant that mainly serves dimsum and a large selection of teas, particularly Oolongs. It's an impressive looking place with a mouth watering display of deserts and must be popular as we had to be shoe horned the schedule as we had not previously booked. We were given twenty or so minutes to drink our tea. 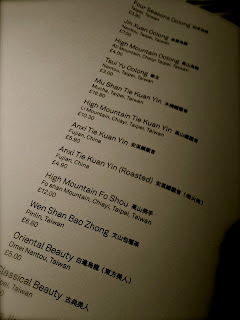 I chose a 'tuo cha' pu erh from 'Yunnan' and selected an Ali Shan oolong for Michelle. Both teas came pre steeped in pots. It was a generous pot of tea but as it was pre prepped each cup was all rather the same, only cooler. Michelle chose a pretty desert from the selection to quell her sweet tooth. Sounds ok so far? Actually no. 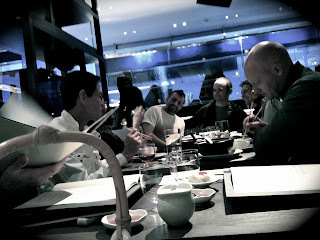 The service was rather impersonal, the seats uncomfortable and almost under the noses of the table adjacent. It just seemed to be another 'trendy' Soho eatery for suit types looking to do whatever it is Soho people do. We felt out of place, uneasy, clostrophobic, rushed and we left as soon as we could. The energy of the place was just awful and quite the opposite from what I was expecting. 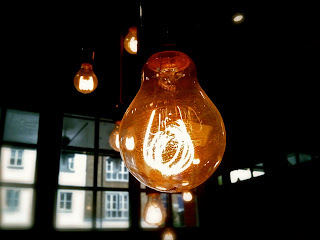 Next stop, Teasmith in London's E1 district... read on.. I was a west London boy and crossing the City over to the east just makes me feel queasy. But amidst the slightly run down vibe of the wild east is a true tea oasis, Teasmith. Inside the charm of Teasmith's is apparent, it's a product of a couples love and hard work. Instead of a single pot pre steeped for you, we had a nice chat about what tea I wanted, had a peak at the bings provided by Nada (who else!) and it was expertly poured by the owner again and again and again. Several infusions later I started to feel a little sorry as Nada's Yiwu was just getting nicer and nicer and poor old Teasmith were only being paid the once. Michelle's Bi Luo Chun was also just superb, I could barely pry the pot away from her as she was enchanted with the smell. What a great place for tea... I just can't say enough about Teasmiths, I am just so impressed. We left Teasmith after an hour or two, I have no idea exactly how long we spent there, fully refreshed and becalmed by the tea and the experience. I can't wait to return for some tea tasting or any reason really.. 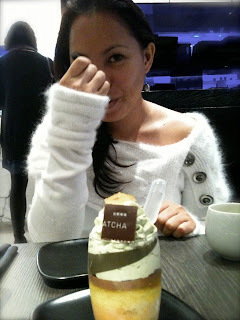 The short story is.. if you are a yuppy and want to look cool, go to Yauatcha. 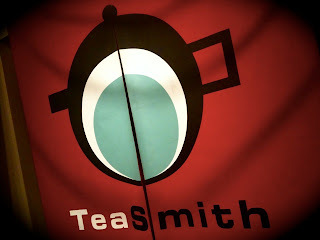 ..if you have a soul and want to enjoy great tea amongst tea lovers, head to Teasmith. Small and unassuming in aroma and leaf, this was a tea I had written off first time around. I was enjoying the unsubtle flavours of my other teas and thought this tea was rather... inert. My frame of mind this time was a negative one. "Which tea should I have today?" I pondered, looking at my jumbled collection. I eyed over my favourite samples that are now thread bare in size. "Perhaps I will just have this one, it's from Nada whom I am fond". There is a bitterness that numbs the tip of my tongue and tries to creep backwards. Instead it rises to the roof of the mouth and is absorbed in the skin there. The subtle liquorice turns to sweetness which hovers just above the tongue, a gentle coating. It's not an invading tea. It doesn't come to the party with reckless abandon. It's a tea that suits being in a darkened, quiet room that if you are to relish you must shut your senses down to appreciate. Oh the folly of beginners. After trying the knock out bitterness of Nada's Bulang I thought I'd pick up a low cost Bulang cake from Pu Erh shop for fun. After all, it was only $12 $17, so if was it was rubbish I wasn't losing too much. If I am honest with myself I was expecting something like Nada's tea as the tea was from the same area, oops. Hmmm, the leaves are certainly full of silvery tips and contrasted with dark leaves, not much in between. Pu Erh Shop's website states that it's an orangey brew and has a refreshing taste. Well, it's certainly orangey but I'm not sure 'refreshing' is the correct term for the taste. I know I'm a simpleton in describing taste and I will keep it simple here. Tobacco and treacle with a very slight apple twinge. The soup is thick, dark and brown sugary sweet with a very powerful tobacco taste. Energetically weak with a slight returning sweetness to it. After four infusions I'm bored with it already and miss the powerful sensations of yesterday's session. I was advised that I should not buy full cakes for now and I think I will struggle to ever finish this cake. I'm not sure it will age well either but it seems I will find out. Still I suppose it's an interesting exercise to see just how this sort of tea ages be it good or bad. Part of my journey in Five Element acupuncture is how to combine the acupuncture theory with herbalism. One of the biggest obstacles to combining Chinese Herbal Medicine (CHM) to Classical Five Element (CFE) is the underlying notion of energetic transfer in needle treatment. Unlike regular TCM diagnosis with it's emphasis on patterns and pathogens, CFE theory is more simplistic and needling generally revolves around removing energetic blocks and making transfers on the sheng and ke cycles. It seems that herbal theory quickly moved away from five phase theory and fitting herbal remedies within a five phase paradigm might be tricky. Hang on, why even attempt to do this? Here in the UK there are a great many CFE practitioners that don't offer herbs. We also have a reasonable orthodox medicine service that will cater for a lot of illness that herbs are good at treating. I still believe there is a gap though for CFE practitioners to be able to offer herbs to benefit their patients without making things too complicated and having to restudy a great deal in TCM diagnosis. CFE leans itself towards chronic disorders that need tonification. I will be exploring basic herbal formulas that deal with tonification over the next few months. Ok, I'm doing this one blind, I haven't checked any of the other reviews on this tea beforehand. I know it's gonna be a good one, I have a lot of faith in Nada to bring the quality. I'm just writing this as I'm going, drinking my tea infusion by infusion. My usual brewing method by warming the yixing pot in boiling tap water, rinsing with tap water then preparing the first infusion with spring water. The aroma is beanie but I want to skip right by the aroma to get to the huigan, it's just great. Sometimes with tea it takes a while for it to kick in, sometimes it never arrives. This tea is all over my mouth after the first infusion, wave after wave of sweet sensations that just don't stop coming. My tongue just feels like it's sweating spicy sugar. I am holding back on making the second infusion because I'm enjoying this first one so much and I must of stopped sipping the tea ages ago! My tongue is still buzzing as the second brew pours over it and just increases the qi. I have to remind myself to slow down and savour the moment. The energetics of the experience is taking precedence over finding words to describe the flavours. Needless to say, I'm enjoying it. This is a session I don't want to end.